This is a report on a project led by the Nature Conservation Foundation and supported with a grant from the Aquarium’s Marine Conservation Action Fund (MCAF) in 2010. MCAF supports the Aquarium’s commitment to ocean conservation by funding small-scale, high-impact projects across the globe. Since its founding in 1999, MCAF has funded more than 100 conservation projects in 36 countries and has disbursed more than $600,000 to protect highly vulnerable species and habitats and to conserve marine biodiversity. Among the most diverse ecosystems on the planet, coral reefs support life for thousands of known species, and perhaps millions more that have yet to be discovered. They are also critically important to humans, providing food, livelihoods and protection from the damage of coastal storms. These vital ecosystems are faced with an increasing number of threats, including global warming. 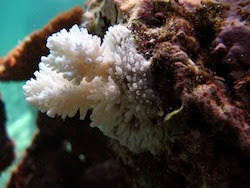 Higher than normal ocean temperatures stress a coral, often causing it to bleach white from the loss of its zooxanthellae, the microscopic algae that live in the coral, give it its color and help it to grow. If the coral is able to recoup these losses, it may recover, if not, it will die. Given that bleaching events are likely to become more frequent with global warming, scientists want to learn more about the factors that determine which reefs are most susceptible to bleaching and which are most resilient. In 2010, MCAF awarded a grant to the Nature Conservation Foundation (NCF) in India to study coral reef resilience in the Lakshadweep Archipelago, a group of islands in the Indian Ocean. The reefs of this archipelago were severely impacted by coral bleaching events in 1998 and 2010. The goal of NCF’s project was to assess the reefs’ responses (both resistance and recovery) in the wake of these bleaching events, in hopes of understanding how they might weather the effects of climate change over the long term. 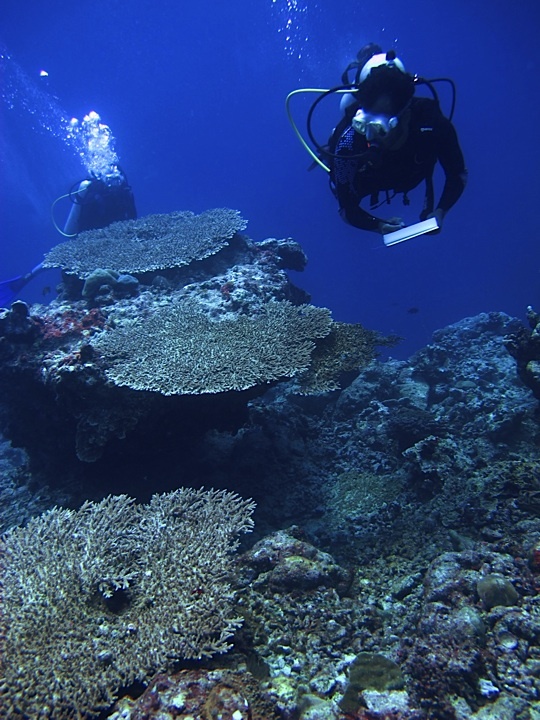 The NCF team, lead by Rohan Arthur, Ph.D., surveyed 42 sites in the archipelago, measuring 30 different ecological and environmental characteristics to calculate a resilience score for each reef. Dr. Arthur’s team has been monitoring changes in these reefs since 1998, allowing them to relate these environmental characteristics with known patterns of resilience responses. The team has identified that reefs across the archipelago vary considerably in their responses to the stress of higher ocean temperatures. So, while some reefs are very susceptible to bleaching, others are highly resilient and still others are highly dynamic—bleaching, dying and then recovering very quickly after ocean warming events. The team is now trying to understand what factors drive these different responses. Although this research is at an early stage, these findings could one day help guide management decisions. Reefs identified as having the greatest potential to survive long-term climate change could be strategically protected from human influences such as overfishing. In the meantime, Dr. Arthur and his team will continue studying the Lakshadweep Archipelago to better understand what the future may hold for these endangered ecosystems.